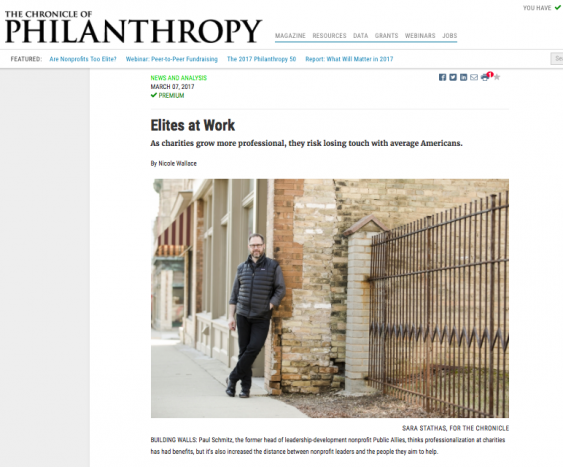 I was recently interviewed for an article in The Chronicle of Philanthropy that asked whether elitism is a problem in the nonprofit sector, especially during an era of increasing populism. For over two decades, I worked to build leadership among very diverse young people, mostly young people of color and “opportunity youth” (young people disconnected from educational and career opportunities). I saw the immense talent that due to lack of credentials and social capital is often neglected and marginalized. In my work, I often play in two worlds — one is a world of national nonprofit leaders, philanthropic leaders, and policymakers; and one which is a world of young leaders and grass roots organizations. I often experienced a cognitive dissonance as I traveled between them, especially in the national conversations that were rarely grounded in the daily lives and experience of the communities I worked in. David Frank’s recent book, Listen Liberal or Whatever Happened to the Party of the People, argues that Democrats have become too tight with the donor class, too satisfied attending Clinton Global Initiatives and Aspen Institute conferences, and too comfortable visiting vacation homes in the Rockies or off Cape Cod. If the Republicans represent the interests of the 1%, he sees Democrats representing the top 10% – the highly educated professional class. As leaders spend most of their time conversing with their peers and schmoozing the 1%, their values and beliefs begin aligning more with them than with the broader population. I winced often when I read his book, spotting experiences I had and how I myself at times experienced entitlement in some of these situations. I believe his book applies just as much to the nonprofit sector as it does to politics. Recognizing the privilege of our situations and opportunities does not mean we must reject them – such opportunities are often ultimately to the benefit of those we serve. We must instead own that is a privilege; create space for others who have not had such privileged access and opportunities; and stay grounded and connected to the communities we represent, willing to speak truth to power on their behalf. I tried my best to do this. BUILDING WALLS: Paul Schmitz, the former head of leadership-development nonprofit Public Allies, thinks professionalization at charities has had benefits, but it’s also increased the distance between nonprofit leaders and the people they aim to help. “For Paul Schmitz, a choice of pizza topping illustrates the awkward place of nonprofits in the post-election environment, wherein “elites” have come under scrutiny. As Mr. Schmitz tells the story, he was attending a high-profile nonprofit conference following the November vote. An innovative leader at the nonprofit Public Allies for more than 20 years, he’s now a management consultant who’s often at gatherings of top nonprofit executives. On this occasion, a casual conversation over dinner turned to a discussion of elitism in the field. As Mr. Schmitz and his acquaintances chewed over the topic, he was struck by the fact that they were eating pizza adorned with … arugula. The irony wasn’t lost on Mr. Schmitz, whose life experiences make him especially attuned to the issues of class in philanthropy and nonprofits. Born and raised in the flyover city of Milwaukee, he attended a commuter college while working as a telemarketer on the side. He was what’s called a “second-chance” student: He battled drug and alcohol addiction in high school, was homeless for a time, and entered college through a vocational program. Today Mr. Schmitz is convinced that many nonprofit leaders have grown too elite, himself included. He argues that charity executives generally share more in common with their donors than with the people they serve. Their alma maters, their neighborhoods, their kids’ schools often speak to lives of relative comfort and opportunity. That wasn’t the case more than 20 years ago when he started Milwaukee’s chapter of Public Allies, a group that works to increase the diversity of the nonprofit work force by placing low-income young people in charity fellowships. Back then, he was a scrappy college student not too different from the young men and women he was helping. The remainder of the article, which sits behind a paywall at The Chronicle of Philanthropy, includes interviews with other leaders, and discusses issues like professionalization of management, the shift from program to fundraising as the route to leadership, executive compensation, and other issues. I believe the conversation must continue about how we as leaders stay grounded and connected to those we serve and not just to those who fund our work.